From the kitchen of One Perfect Bite...It's time for the March challenge at Recipes to Rival. This month's challenge, chosen by Temperama of High on the Hog, was roasting a whole fish in a salt crust. She gave us the option of using another protein for the exercise and that's what I decided to do. Bob and I had our first sampling of salt crusted meat in China. Once home, I learned how to roast a whole salt crusted chicken that was a reasonable facsimile of what we had eaten in Asia. I first thought I'd use that for this month's challenge but there were a couple of drawbacks. It was neither quick nor easy to do and Bob pointed out that it had absolutely no color and was singularly unattractive. He also reminded me of the burns I received from the hot salt. I remembered a recipe that I'd seen and clipped for a pork tenderloin that was roasted in a salt crust, but, of course, couldn't find it. Google to the rescue. I found another recipe in an article written by Ezra Klein for The American Prospect and decided to use it for the challenge. The recipe originally appeared in the L.A. Times. The procedure is quite simple and, if you're the least bit adventurous, I urge you to give it a try. While I think the merits of salt crusted roasting are overrated, that doesn't mean it shouldn't be tried. So, if you have time and an obscene amount of salt, I urge you to expand your cooking repertoire. You won't hate the finished product. There are basically three ways to salt roast. Loose salt is most often used with vegetables and shellfish. Shellfish are buried in already hot salt, while vegetables will have salt poured over them. Another method combines salt with water to produce a mixture that looks like wet sand. The "sand" is packed by handfuls over whatever is being roasted. 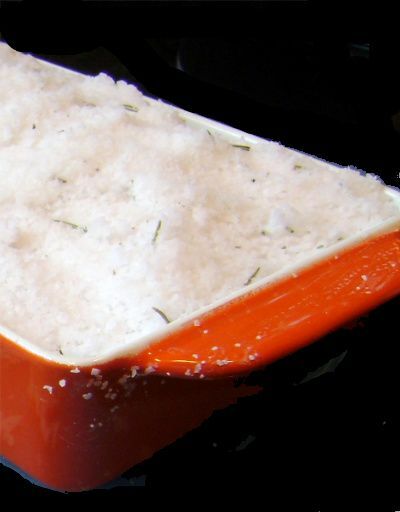 Salt can also be mixed with egg whites before roasting. Some think the egg whites make the "whatever" roast less salty. Interestingly, none of these methods produce something that is unbearably salty, but you'll have to be the final judge of that. Here's the recipe for salt crusted pork tenderloin. Enjoy! 1) Heat oven to 400 degrees. Combine rosemary and salt in a large mixing bowl and stir in 1 cup of water. Mix until texture is like gritty snow or sand. 2) In a large skillet, heat oil until it shimmers. Pat pork tenderloin dry with paper towels and sear it in hot oil until it is browned on all sides, about 8 minutes. 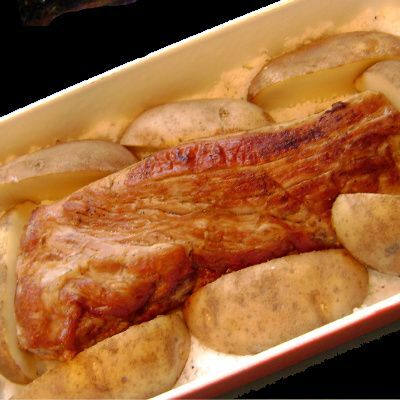 3) While pork is browning, spoon a layer of salt about one-fourth-inch thick in bottom of a gratin or baking dish just big enough to hold pork and potatoes in a single layer. 4) When pork is browned, pat it dry with a paper towel to remove any excess oil and place it in center of gratin dish. Arrange potatoes around the outside and cover everything with remaining salt. 5) Roast until pork reaches an internal temperature of 145 degrees, about 20 to 25 minutes. At this point, pork will be quite moist but still a little pink. If you prefer pork to be more cooked, push temperature to 150, about 5 more minutes. Remove baking dish from the oven and let set 5 minutes to finish cooking. 6) With a sturdy metal spoon or chef's knife, chip a crack around base of salt crust and carefully lift off top. Use a dry pastry brush to brush away any salt on surface of potatoes or pork, turning pork over to brush all sides. Transfer pork to a carving board. Slice pork into medallions one-fourth-inch thick and arrange on a serving platter. Place potatoes in a medium bowl and toss with the shallots and butter just until coated, discarding any excess butter. Arrange potatoes around outside of pork and serve immediately. Yield: 3 to 4 servings. Mary,this look very similar to Chinese roast pork, but we prepared with the skin on and must roast till crispy skin..Your pork also looks good. 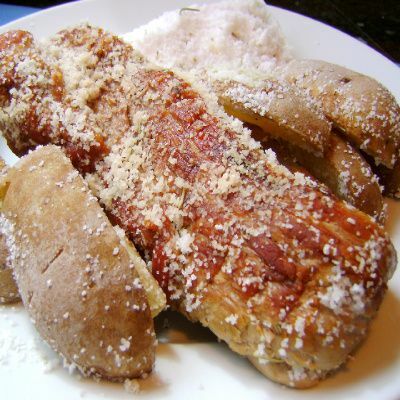 I love to prepare pork tenderloin for the ease and speed of cooking; I had been wanting to try a salt crust for a long time but never followed through; I think I should now! I've never done this but have seen it done on FN. It's an interesting preparation. This looks delicious. What an interesting way to cook a tenderloin. Gosh, the meat really looks moist. I have some pork tenderloin in the freezer and I loved your recipe. Looks perfectly cooked. There is a famous Chinese dish that cook a whole chicken covered with rock salt so I can imagine how good this must be! I have never tried roasting in salt.. but a friend was just over the moon about a fish he did that way and now you... looks like I need to try this technique! I've never seen this but it certainly looks interesting. We LOVE salt so this may be something I'll do in the future. Thanks for a great idea! This looks incredible,never heard about roasting meat in salt. I Know about roasting the fish in salt and they add egg whites to bind it and make it hard. Your method is new and intersting. You take the most beautiful pictures! Love the even light and rich, saturated colors. I have photo envy. Other than pork, we also do it with chicken but wrap with parchment paper. We called it 'beggars chicken' but some called it 'The Emperor Chicken'! The difference is the ingredients used to marinade the chicken. I love fish in a salt crust and have made it before. I've never tried it with pork loin but now I want to! Interesting! I would never have thought to salt-crust my pork but it is definitely worth a go. Mary I have something for you on my blog. Very interesting! I have been wanting to try salt crusted fish for some time, but have before seen a recipe for salt baked pork. It looks yummy (if a bit messy to prepare!) so maybe I'll skip the fish and try this instead. Thanks! You had me at pork and salt. Which are basically too of my most favorite tings. On this earth. I've always wanted to try a salt-crusted fish, but my gardener thinks it would be too salty. I'm glad to know it doesn't really affect the meat. I've been intrigued by salt-crusted preparations for a while, but they intimidate me... Thank you for sharing and making it look accessible - and yummy! Interesting! I've never done the whole salt-crusting thing before. It looks delicious, Mary. Your pork turned out perfectly cooked, with just a hint of pink in the middle. Delicious. It looks good--the pork looks so moist and tender. What an interesting way of cooking! Must be very flavourful and delicious. Mary, I'd never heard of salt crusting anything except fish before now. You've opened up my eyes to a whole new world. This looks mouthwateringly tender. Thanks again. My family loves pork tenderloin. I've always wanted to try this method. Thanks for the recipe. Mary it looks like another wonderful recipe! 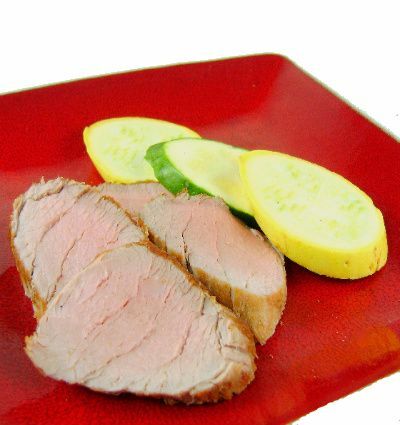 and we do love a sweet and lean pork tenderloin. We love going to the coast during storms and especially walking the beach and picking stones. Mary, we wish you and Bob a wonderful weekend and many blessing this Easter season. Thanks for visiting me today. You have some delightful recipes here. I love that you make Limoncello and the pork roast looks wonderful. Where in the NW are you? Interesting technique. Maybe something to try next Christmas.